Yeah, I finally figured out that my eyes are blue-hazel. i dont suppose you can tell me why i have that can you? hello, do you know why i have lilac around the pupil of my eye and then have the actually blue colour? is that normal? why might that be? same with my son, sometimes they look so yellow but they are hazel green or yellow hazel green, not sure. My eyes are a pale blue ring around the outside, and a green ring closer to the pupil. I have no idea what color to call them? Theres an eyecolor called amber thats really rare. People sometimes call it the wolf eye since it’s the same golden yellow as a wolf’s eye. I think these eyes are really awesome and I have yet to see anybody with this color. I really can’t exactly tell whether my eyes are dark brown or light brown. what color do you suggest i have? where can i send you a photo: eyemakeart?? sending me a picture probably won’t settle anything because colour also varies from screen to screen. If it is a real concern, you should consult an iridologist in person. Wow,my eye color isn`t up there.I have a vivid blue that changes color throughout the day.From looking black to sky blue. I Like your web site. I always thought i had plain old brown eyes. So I found your site and checked in the mirror and found out I have exciting dark blue-hazel eyes. I guess my eyes changed sometime in my life because I have always had brown eyes. It would be interesting to take close up pictures of a child’s eyes and follow their color through their life. Maybe there would be some provable pattern to the color change. Hmm I didn’t see my husband’s eye color on here. His eyes are yellow with a blue rim around the iris. He also has a heart shaped birth mark in his eye. [IMG]http://i54.tinypic.com/34djyue.jpg[/IMG] I hope this image shows up – I still don’t know what to call my 7 month old daughter’s eye color. I still can’t seem to figure out where it goes on your chart, and your chart is the best one I’ve been able to find. I am looking for color name suggestions. I was just messing around, looking at eye colours for the characters in a story of mine, but then I stared at myself in the mirror and realized that my eyes are different! I have sectoral heterochromia on my left eye which makes half of it look balck, and the other half light-light brown. My other eye is a warm champagne-ish colour… Like zephy’s. I’m a bit curious about my eye color. Its color falls somewhere between a very light bluish-gray normally but different lightings sometimes make them appear as a fairly dark blue, gray, or even a green. Someone said that this actually classifies my eyes as gray… So what color would they actually be? My eyes are basically the same color! My eyes are a geen-blue-grey color that I usually distinguish as green grey. My eyes are a green grey but they start with a dark green ring on the outsite. they also have a ring of light hazel in the middle of the iris. My friend has one green eye and one dark blue. they look amazing and change colours sometimes. who else has eyes like this or ones like mine??? I’m in my 50’s. I grew up thinking my eye color was hazel, because that’s what my mother told me when I was younger. I just accepted it. I recently took a good look at my eyes and matched them to a color chart because my daughter had questions about eye color that arose while studying genetics. I had a bit of a shock as I realized that my eyes are most definitely green, NOT hazel! In fact, my eye color isn’t even close to hazel. I have clear, light pigmentation with a distinct darker green ring around the iris. The tone is a slightly olive green (which has more of a grayish-green tone) not an emerald green (which has more bluish tones). My eyes have absolutely no brown, hazel or blue speckling or striation at all. Just clear, light olive green. I’m irrationally angry with my mother for telling me that I had hazel eyes, which I always considered a boring non-color. I can’t believe I’ve spent my entire life thinking I had an eye color that I didn’t have. Green eyes are a rare and special color and I feel somewhat cheated. Maybe I’m being a little silly, but I’m stilll somewhat upset about it…. How do I email you? I have very dark blue eyes (no examples in above chart) & thought you might like to have a photo to use in future eye color charts. soo my eyes are liight brown right around the pupil then theres a white sqiggly circle around that then its like grayish greenish blueish colour then dark grayish greenish blueish colour around the outside of the iris, so what colour are my eyes? i cant tell, once in class we were supposed to ask our partner what colour eyes we had an i didnt know then three of em started arguing over what colour they were, blue, green, or grey..O.O shyooo what are they?? I would very much like to see a picture of your eye, Juanita. My eyes are………well……..I guess they’re best described as brown, though they constantly change colour through shades of brown and brown hazel. I am not sure what color my eyes are, they start with a dark blue circle and then continue inwards with a very dark green that has a mixture of brown. WHAT COLOR ARE THEY!! Thanks, I found my eyes color, it is green-hazel. Ok, can I get an opinion on my color I don’t think it was on there. Some say grey, some say green, some say blue, or turquoise. Tell if you can get to all the pictures through this link, if not I will post them individually. Thank you! My eye color is from green to hazel. I’m pretty sure my eyes are not hazel. They don’t look anywhere near brown. They don’t even change colors. They are pretty much a jade green in my opinion. Anyone with the same kind of color?? what to call them?? I dont even know if the base color is brown og blue.. my mother has dark brown eyes, and my fathers are clear ice-blue.. so I’m kind of a mix! I would also like to see a photo of your eyes. They sound extremely interesting! 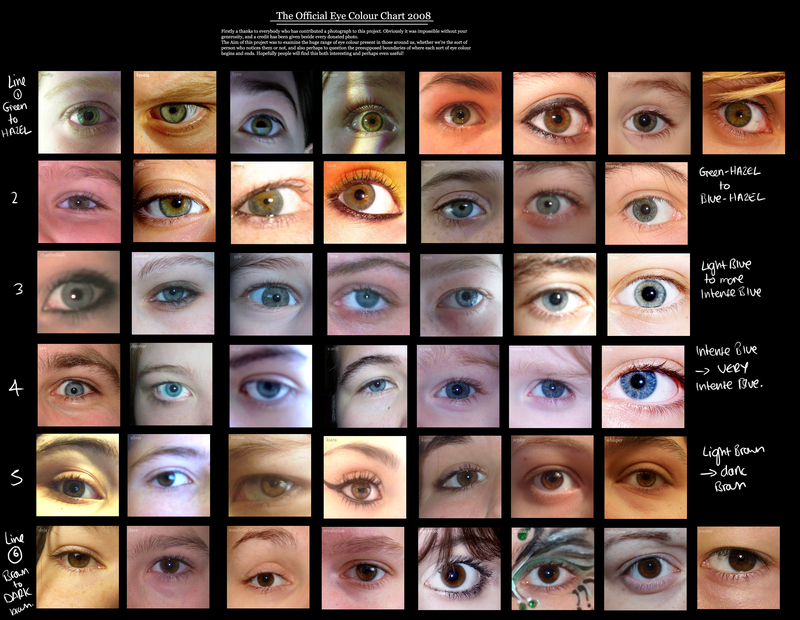 Hi great chart , think my peepers are almost same as marvells is that green hazel ? I did nt even know what colour hazel was. WOW the 4th eye on the line 1, is hazel or green? cause my eyes are just like that..
My eyes are… unusual. They start off eith a ring of light blue then fade into a ring of green then go to amber (the color that most of my eye is) and finally, theres a thickish line of violet. Is that normal? I don’t see my eye color on the chart. My eyes, are weird, the outline of my eye is a dark blue, then the inside is like a dark blue to hazel-greenish color, then by my pupil it’s light blue. My mom has hazel eyes, but my dad has light blue eyes. How is it that I don’t have their eye color. Can you explain to me why that is. Plus my eyes change shades during the seasons, it changes shades, like the inside part of my eye does. Is that normal? My Centeral Eye ball is cut from one side. It is not full circle. Is there any disease in my eye? My eyes aren’t on the chart either. I have a ring around my eyes of a grey color then it’s a really yellow color starting from the bottom and it gets darker to where it seems like a shade of green but surrounding the pupil is sorta like black lashes. Wow, your eyes sound really cool! Could I see a photo? I love this site! Very interesting!! I didn’t really see my exact eye color, but I’ll describe. They are definitely green and they have a golden green splash of color around the pupil. They have a gray ring around the entire iris. Kinda hard to describe. They are an awkward color if you ask me haha!! I think yours might be very close to mine! My eyes are usually the green and brown acrium on the top but today I looked in the mirror and they are totally bala. NOOOOO where’d my beautiful green go :’C ? When you’re close to me my eyes are hazel but when you’re far away my eyes are dark grey on the outside and light grey on the inside. Sometimes they are light blue and whenever I ask people what they are, they always say something different. I bought a magnifying mirror and with good light -my eyes are deep set- they are three colors: dark olive khaki green, light golden brown, and a ring of true gray around the outer iris. Makeup suitable for green/hazel eyes such as pink, magenta, lilac, rose, mid tone purple, peach, steel grey have worked for me though I have been told to wear greens, dark browns, navy blue and copper all my life, but they look terrible on me, almost like I am ill. I have pale skin, medium brown hair (born strawberry blonde). So, I am having a bit of trouble with the eye color chart, but it is safe to say I am in the dark hazel and dark olive green range! I am finding that green and grey tones are more common than once thought. Brown is still the #1 color by sheer numbers, but in my case, the closest I get to brown is a light golden brown part toward the middle despite my parent’s insistence. Is it me or line 5, number 3, is way more solid hazel rather than brown. I see a faint green tint, too. Um… I’m not really sure of my eye color. It’s not really a GREY. I mean its a grey but not a conpete grey. Gods I’m CONFUSEING myself anyway my eyes are a blue-ish color. But it kinda has a LITTLE green in it? Like marble? Not too much green. BARLY any green only a little. Around my pupil there are brown flecks. I always thought my eyes were blue. A lot of my family has blue eyes. I just assumed. But hey, what do ya know. I might have GREY eyes. But the ONE thing that confuses me is that how do I have grey eyes? Non of my family had grey eyes. Help? Any one?